You’re the smarty friend of your herd. Your herd is only two, you, a unicorn, and Bluey, a pegasus. Well, kind of two. Perhaps it would be better to say two halves. One body. Though you’re the smarty, you’re also the end that poops. Your second words were “wife nu pretty”. Hooman munstas have no desire to actually kill you. The abusers end up scaring Bluey so bad he makes sorry poopies. They watch and figure that your existence alone is crueler than anything they could ever do to you. The ones who typically take care of and love fluffies can’t bring themselves to kill a healthy fluffy. You are, technically healthy. Bluey’s thriving, and thus you are too. But they can’t bear to see your misery, so they don’t take you in either, so you became a feral herd – the two of you. Luckily, Bluey’s happy to let you be the smarty. He doesn’t seem to realize that all of your smarty ideas involve attempting suicide. You’ve been out on your own for a while now. You’ve actually outlived almost every feral herd you’ve come across. None of them let you join; you’re too weird looking. This also has protected you from being eaten by the various non-human munstas. 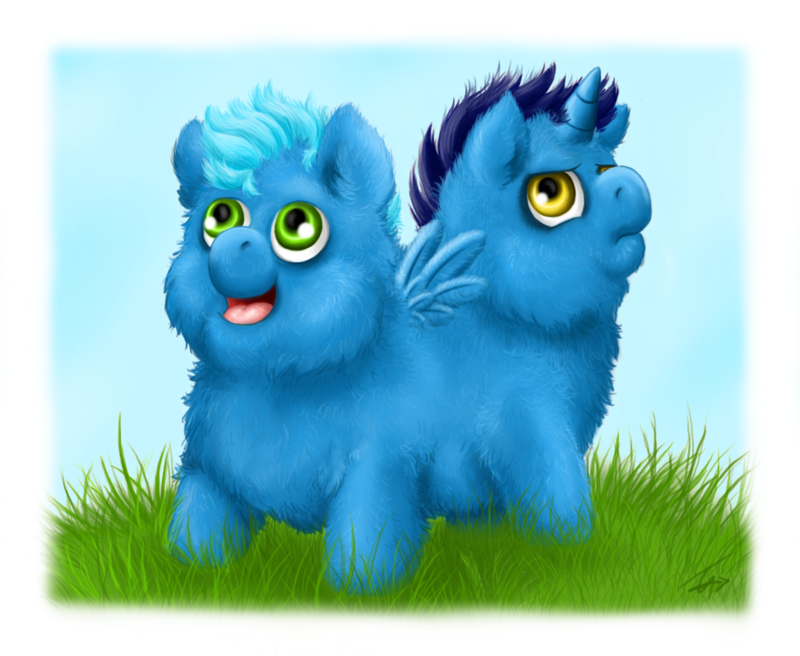 For whatever reason, even if you’re near a herd, every other fluffy pony will get attacked but you. Bird munstas, stripey munstas, cat munstas, dog munstas, they all pass you by. They know you don’t look right, and things that don’t look right might be not-nummies. You’ve tried chasing after them. You’re the only fluffy who can actually scare them off. Usually this happens after the nearby herd is dead. Otherwise, they might realize it would pay to have you around. Not that you particularly care about companionship. You just want one thing: The sweet huggies of longest sleeps. This morning you wander out of the park to look around and work on a new plan. Bluey just likes seeing things. Bluey likes everything, really. The mention of new friends gives you an idea. You remember hearing stories of scattered herds when their smarty tried to pick a fight with a hooman munsta over their land. It didn’t end well. Well, for them. For you, it’d be perfect. Start looking around for a good hooman safe place. Find a big one with lush, green grassie-nummies and pretty flower-nummies and a big wooden sign out front. That sign probably says something like “FLUFFIES GET LONGEST SLEEPS IF COME HERE TO HOOMAN SAFE PLACE”. Silly hoomans don’t realize fluffies can’t read. But you don’t care, you’re here for one thing only, and it’s the thing that’s on the sign probably. You barge up to the door. Bluey grazes while you wait. Maybe the huuman munsta didn’t hear you? You puff out your cheeks for good measure. Bluey continues to graze. No response. By this time, Bluey’s stopped grazing. That’s all you hear. Certainly no hooman munstas. You’re about to yell even louder when you get pushed over from the side and fall down. You wander away as the bigger herd starts eating and snuffling around. Bluey’s ears perk up, but since he’s full he doesn’t feel any desire to go over and check it out himself. Not like the herd would let you anyway. You hear a lot of frantic eating, and then… silence. The fluffy mummas of the herd are finally almost to the blue-nummy place with their attendants. Wait… that means…. there was bad-for-fluffy nummies out? And if they’re all dead, they can’t try to hoard them all for themselves! You get over there and see the scene. Fluffies all over taking longest sleeps with white spitty foamy stuff in their mouths. Little bit of boo-boo juice around too. Bluey starts to get nervous but you move in closer. You see lots of little nummies-places… but they’re all empty. The herd was greedy and ate all the bad-for-fluffy nummies! And by this time Bluey starts noticing the boo-boo juice. The crying mummas start getting louder. You think you see some of them going into scaredy-fits even. You start to walk back. You hear a pop. Bluey didn’t like that at all. You’ve just dodged death again. You are the unluckiest fluffy in the world.